Verbania was defined a “garden on the lake”. This is a large municipality created in 1939 as a result of the union between Intra (the largest town, located opposite Laveno) and Pallanza (overlooking the Gulf of Borromeo). A perfect organisation for tourists contributes to making Verbania an excellent international holiday town. Today, Verbania is the leading industrial-commercial town on Lake Maggiore and since 1992, has been the county town of the province of Verbano-Cusio-Ossola, which spans from Omegna on Lake Orta to Formazza Valley in the most northern part of Piedmont. However, as the towns it encompasses don’t have century-old history, if considered individually they don’t exceed the number of inhabitants of Arona, which is the most populated “historic” city on the lake. During the fascist period, some of the villages in the hinterland – and not only – were united with the two most important towns on the Riviera: Pallanza and Intra. Suna and Cavandone were united under the first, which already included the hamlet of Fondotoce, while Trobaso, Zoverallo and Unchio were included with the latter. Verbania was created in 1939 with the union of Intra and Pallanza. The name comes from the name of the lake, which in addition to being called Lake Maggiore, is also referred to as Lake Verbano. The two towns remain separated along the lakeshores by the magnificent Castagnola headland, which is home to several villas. One of the greatest attractions on Lake Maggiore is located here: Villa Taranto. 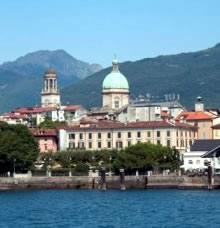 The Municipality of Verbania and its multiple towns occupy a very large surface area overlooking a long stretch of the Piedmont coast of the lake. It ranges from Fondotoce, precisely at the mouth of the river flowing into the heart of the Gulf of Borromeo, to the northern coasts of the gulf, crossing Suna and Pallanza. A glimpse can be caught of Isola Madre (Madre Island) from the gulf, which despite it belonging to Stresa, is closer to the coasts of Verbania, and of Isola Bella (Bella Island) and Isola dei Pescatori (Pescatori Island) in the background. Just before the tip of the Castagnola headland and a few metres off the coast is Isolino di San Giovanni (Islet of San Giovanni), which is also the property of the Borromeo family. Past the headland is a completely different atmosphere. Here in Intra, life appears to be from somewhere else. A ferry connects it with Laveno on the Lombard shore and is also used by commuters and students. The coast decidedly points northwards, where the view also spans from the lakeside towards Sasso del Ferro, Rocca di Caldé and Castelveccana, and to the mountains of nearby Switzerland in the background. This section of lake is rather windy and the slopes of the rugged mountains sheltered by the Val Grande National Park plunge into it here. Several annual events take place in Verbania. Many are associated with the art of gardening due to the unique local climate so much so, when the various varieties bloom, weeks are dedicated to the tulip, orchid, azalea and camellia. It all comes to an end with an explosion of flowers known as Corso Fiorito, a grand parade of blooming floats held the first Sunday in September. The national equestrian competition season at the Fondotoce horse centre starts in May and concludes in October. There are several initiatives in July and August: concerts at Villa Giulia, sailing regattas, sports competitions, outdoor movie events, street markets, etc. The praiseworthy initiative Verbania Città dei Bambini (Verbania, a city for children) closes the season in September.